Seriously, don’t read this if you don’t want spoilers. It’s been six long years since “The Twelve” (which came out only two years after “The Passage”), so don’t let this review spoil your own anticipation. OK? Yes, the story is exactly 50 words long. That’s it. Take a look, click on the “Like” button, and come back and let me know what you think. A fun, though at times, implausible read about how a computer genius works for a hedge fund and creates a powerful algorithm that learns not only how to work the stock market, but how to leverage information it can glean from all sorts of digital sources, such as the news. I felt like I learned a lot about algorithmic trading, in which computers buy and sell stocks in milliseconds. The main character, though, was hard to like. He was a cranky genius, more concerned about his artificial intelligence than anything else. So when it seems like his identity is stolen and things happen to him that he seems to be the cause of (through orders made from his email and payments made from his accounts), and it is clear that his clever AI is behind it though no one believes him, it seems Harris is trying to make him sympathetic. But his cranky reactions (and over actions) and inability to communicate make him annoying. Luckily, the super clever AI is still there, churning away dastardly plot points to keep the novel moving. It’s pure escapist fun, and enough of a framework with which to explore all the good research that went into making the speculative fiction seem somewhat plausible. Murakami’s imaginative worlds — with preternaturally gifted girls, bewildered young men, misshapen men, magical creatures, violence, and passageways between various forms of reality — all set in a recognizable every-day mundaneness of contemporary Japan are the main element that attracts me to his work. “1Q84” doesn’t disappoint. And the quote above does a great job of summing up the novelist’s approach to this novel and to writing in general — you have to go with wherever “reality” takes you. In “1Q84” that reality is a strange Japan in 1984, in which some characters can see two moons, and in which strange beings, called Little People, have such extraordinary powers that they help to power a religious cult, which rests at the heart of this really long novel. 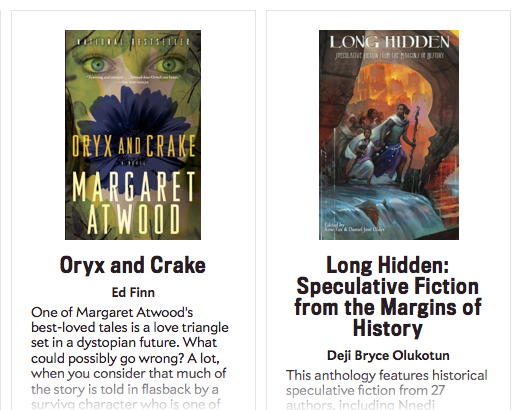 Slate has a new feature called Slate Picks, and under the heading “Science Fiction That Can Change Our Future” they asked contributors what books they would recommend for the 2016 presidential candidates. The list of books includes such well-known and respected authors as Margaret Atwood, Kim Stanley Robinson, Cory Doctorow, Elizabeth Bear, and Samuel Delaney. The list also includes an anthology that has a story by yours truly in it, Long Hidden: Speculative Fiction from the Margins of History. So if you’re looking for a gift for the presidential candidate in your life, check out Slate Picks.